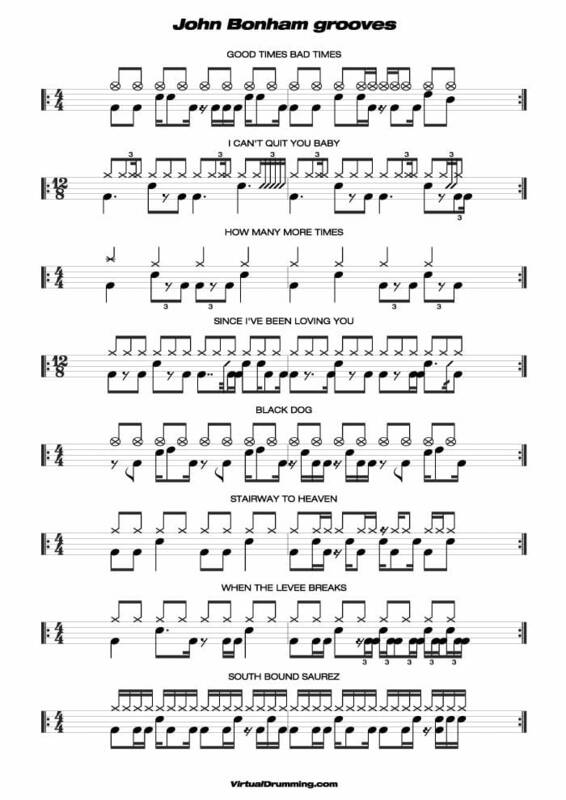 This pdf music sheet contains free drum transcriptions of some famous drum grooves of John Bonham from Led Zeppelin. John Bonham, Led Zeppelin's drummer, reached his popularity in the '70's, drumming in some of the most famous songs in rock music history. The style of John Bonham is still a model for many young drummers, in rock'n'roll music and in more recent musical languages. In the pdf music sheet of this lesson you'll find the transcriptions of some drum grooves taken from famous Led Zeppelin's songs, as played by the late, great John Bonham. John Bonham with Led Zeppelin album "Led Zeppelin" 1969: Good Times Bad Times, I Can't Quit You Baby, How Many More Times. John Bonham with Led Zeppelin album "Led Zeppelin III" 1970: Since I've Been Loving You. John Bonham with Led Zeppelin album "Led Zeppelin IV" 1971: Black Dog, Stairway To Heaven, When The Levee Breaks. John Bonham with Led Zeppelin album "In Through The Out Door" 1979: South Bound Saurez. Drum set elements The graphic symbols of drum set elements in drum sheet music. Notes and Rests Notes and rests value in drum sheet music. Tie and Dot Tie and dot in drum sheet music. Do you want to play online the virtual drum set of John Bonham? Play the virtual drums: you can choose the drum set of John Bonham or your favorite drummer.